The announcement that the Chinese artist Ai Weiwei is to be the next artist to take on Tate Modern‘s annual Turbine Hall commission is unsurprising – though surprise, spectacle and a kind of art that is accessible to the widest possible public are what the Turbine Hall demands, even if the spectacle is of a quiet or understated sort. Subtlety and artistic sophistication are a bonus. The most successful Unilever commissions have not necessarily been the easiest, and the Turbine Hall is a tough testing ground for any artist. 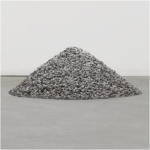 But Ai Weiwei’s work is as often controversial as it is provocative. It is also – undeniably – fun. He fits the bill perfectly. But increasingly, Ai’s canvas is the Internet, where the battlelines of free expression in today’s China are drawn by bloggers and censors, netizens and patrollers paid to ferret out sensitive commentary. “This society lacks a person who is willing to express himself, who has the opportunity to do so, and the ability,” Ai said in an interview at his workspace, Fake, a brick compound with a bamboo garden in one of Beijing’s gallery districts. Ai has never been arrested. He gets away with being outspoken because of the prestige of his father, poet Ai Qing, because he picks his battles carefully and because his own art has brought wealth and fame overseas. “Ai is a highly accomplished artist and a cultural celebrity. He has an extremely well-known poet father and has social status and connection that are far above average Chinese citizens,” said Xiao Qiang, founder of China Digital Times, which translates and documents the Chinese Internet.